With an NHL lockout facing the nation, it’s safe to say we as Canadians are preparing ourselves for a winter deprived of our most beloved sport, hockey. But Mars® Canada is well prepared to use this time, energizing the country from coast-to-coast and encouraging you to get involved in a side of hockey that truly makes a difference. Every community has their local hockey rink. Often, this is a place where people come together and a where we can feel at home. But it isn’t always easy to maintain a rink so it remains an enjoyable space. Actually, a recent survey conducted by Leger Marketing and commissioned by the Mars® brand revealed that while more than 90% of Canadians live near an ice rink, and value the positive impact a rink has on a community, most are surprisingly unaware of the current physical state of their facilities. This is where Mars® has stepped in to help out. After the successful renovation of a rink in Grand Manan, N.B., Mars® has further identified five local rinks within Canada that could use a bit of a facelift. 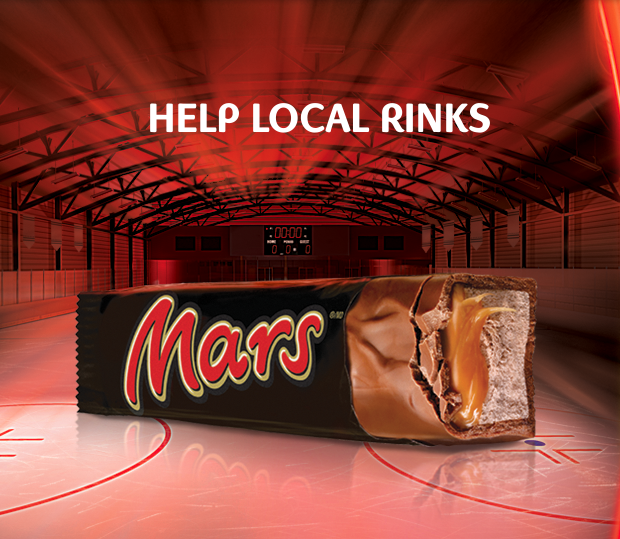 Now, by purchasing a specially marked Mars® and entering the PIN code contained inside the wrapper at www.marsbar.ca, Canadians will activate a $5 CDN contribution , up to a maximum of $ 100,000 CDN in 2012, to be shared amongst the participating community rinks in need of renovations. Canadians, roll up your sleeves and make a positive impact on local communities by helping out hockey rinks in need. Mars Canada would love to give away $50 Mars prize pack to one lucky Canadian reader of The One Income Dollar.A random draw will be made by Random.org on October 25, 2012 from all Canadian entries received. Please leave us your email and Mars Canada a comment about this promotion. What a great promotion to help hockey rinks in need of upgrades. I think that is a great promotion. I love mars! Mars bars are my favorite and this is such a generous promotion. Not that I need an excuse to buy more chocolate but this is definitely a good one! This is a fabulous promotion! Awesome promotion Mars Canada.... must go get one and enter my pin number. Thanks for the giveaway oneincomedollor. I Like my It Works on Facebook (not sure how it works with this giveaway)? Great promotion to revive community rinks. People need to get out more. I am an an email subscriber. I like my It Works on FB. What a brilliant promotion by Mars! I'm sure that they will help alot of people! How generous! A $5 per pin code donation is pretty huge. What a good way to support community rinks. What a great promotion. So many people use the rinks. Great promotion! We love Mars in our family. We love Mars bars. It is so neat that they are doing this for the hockey rinks. oh,yum!! Mars is one of my favorite bars..great giveaway,thanks!! This is a great promotion by Mars - needed in the community! I'll be buying a Mars bar soon. Mars is my absolute fave chocolate bar!!! Yum!! Mars Canada always has great promotions and this is another great one. I really like this promotion as it supports local communities in need. I love knowing where the money is going. Great job, Mars! This is a great promotion especially for the communities that receive the facelifts.